But with the business of the holiday season, it can be hard to keep up with some of the more elaborate traditions (like making homemade fruitcake) that have been passed down from generation to generation. What’s a busy family to do? Simplify. When you are finding that you can’t keep up with traditions of times past, it’s time to create new, meaningful traditions for the present. Here are 5 no fuss holiday traditions that we have started in our home that both are fun and family friendly. For some reason, getting new pajamas to wear on Christmas Eve is a huge hit around here. We try to opt for something festive and comfortable, and choose a style that flatters most everyone. The added bonus is that when everyone is wearing fairly coordinating pajamas it makes for great family photos, without really trying. If you drive around town long enough you’re bound to find a neighborhood that has amazing holiday light displays. Pile in the car, buckle in, stop for hot cocoa and seek out your local festival of lights. Take a few minutes to sit together as a family and read the Christmas story as it is told in Luke Chapter 2 versus 1-20 of the Bible. If you are celebrating Christmas, it’s a good idea that your children are reminded as to why. Even if you aren’t a usual churchgoer, there’s something special about gathering with others and singing traditional Christmas carols by candlelight. Check your local paper for a listing of candlelight Christmas Eve services near you. Decorating cookies is my go to activity for most holidays. I think it is because they’re fun to make and great to eat! Cut out sugar cookie dough using Christmas-themed cookie cutters and bake the dough to perfection. Fill small paper cups with various colors of frosting, small candies and sprinkles. Plastic spoons (for younger kids) and knives work great for spreading the frosting. Decorate an extra batch to bring to an elderly neighbor or friend. 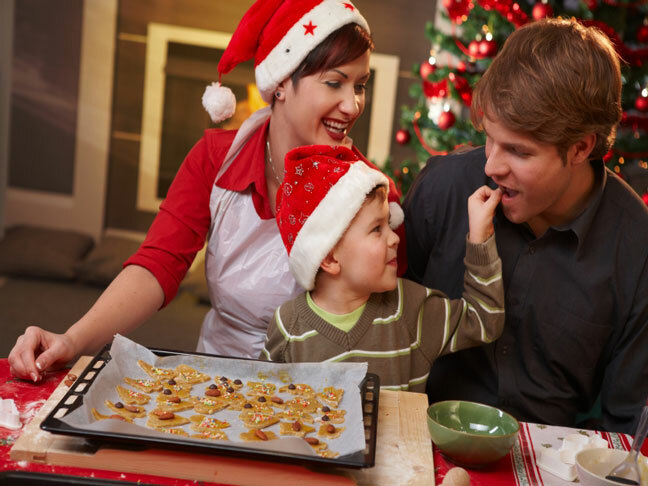 Have you had to tweak any of your holiday family traditions? What traditions are popular in your home? Share your favorite traditions below!